“A Quiet Place” as a title accurately represents both the content of the movie while capturing the atmosphere of the theatre. The eerie silence that the Abbott family is forced to endure for survival is paralleled by the audience. After a mere five minutes, we are introduced to the lethal monsters that inhabit their world. These creatures are blind and hunt solely based on sound. After we see just what these dangerous creatures can do, the audience is compelled into silence, afraid of what will happen to them if they munch too loudly on popcorn. While the audience only lives in this silent dystopia for 95 minutes, the Abbott family has survived over a year in this near post-apocalyptic future. This particular family is comprised of Lee Abbott (John Krasinski), his pregnant wife Evelyn (Emily Blunt) with their son Marcus (Noah Jupe) and their deaf daughter Reagan (Millicent Simmonds). The Abbott’s have a unique advantage compared to the other families. Due to their daughter’s deafness, the family was proficient in sign language before the creatures appeared. Now, they are able to communicate effectively without noise. The measures the Abbott family must go to in order to survive may seem extreme. Can a whisper really end up killing them? Do they really have to resort to communication via sign language? Krasinski made this necessity very apparent with details embedded throughout the film. The opening scene begins in an average store, however, in the background, you can see that the only items left are bags of chips and pill bottles. The monsters are so sensitive to sound that a single bag of potato chips is the difference between life and death. A minuscule sound can trigger their fight response, and the louder the sound the more urgent the aliens respond. Details like this are what elevate the intensity of the main plot. As previously mentioned, pregnant Evelyn Abbott is due within the next couple of weeks. If something as minor as pills rattling in a bottle can result in death, imagine a woman in labor. Evelyn must rely on the other members of her family to create enough noise to draw the creatures away from her and the baby. With the Abbott’s scattered across their land, and Evelyn going through labor, anxieties are high. While the film is undoubtedly a true horror flick, Krasinski implements original concepts that have been hardly explored in the genre. The first and most obvious concept is the absence of sound. Often enough in horror films, the audience is gripping onto the armrests of their chairs, completely silent waiting for the plot to unfold. In “A Quiet Place,” the audience feels the same tensions as other horror films, but now fear to let out a scream. Eliminating sound is not the only concept that separates this film from others in its genre, however. 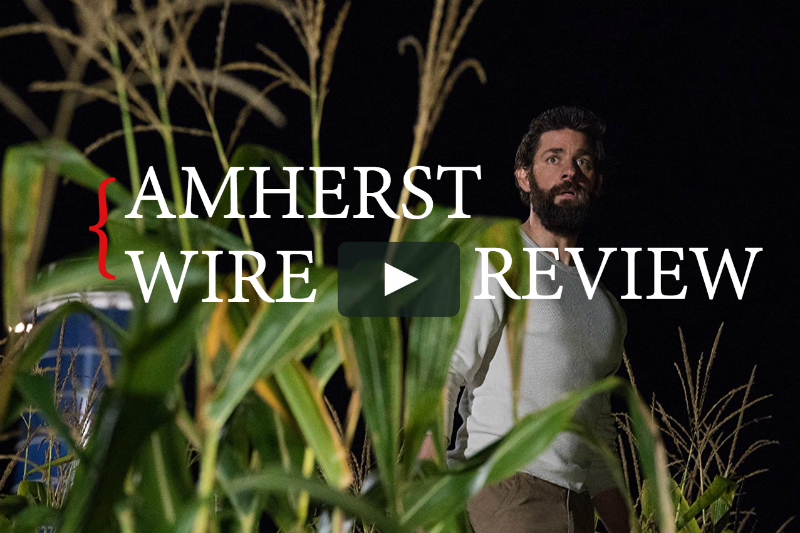 “A Quiet Place” implements characters that actually develop as opposed to the one-dimensional caricatures that are typically featured in horror movies. Viewers are more likely to become attached to the Abbott family, and they are not seen as “disposable.” The family makes intelligent, yet realistic choices, which allows the audience to relate to them. Throughout the film, everyone walks without shoes, and on top of that Lee Abbot spread out sand paths for his family to walk on. This would soften their steps so much that it hardly made a sound. Lee also used sand to show where to step inside of their house to make the least amount of creaks possible. In my mind, the success of “A Quiet Place” is also another example of a comedic mind generating a deeply horrific story that was well-received by audiences. After Jordan Peele’s successful 2017 film “Get Out,” thrill seekers were awaiting another horror film to create a similar “on the edge of your seat” anxiety. These films will hopefully invite more directors of other genres to continue reinvigorating the horror canon. Luckily for us, Krasinski plans on doing just that. Email Chase at [email protected], or follow him on Twitter @chase1kent.